The world of business writing can seem vast. Each office seems to have variations of documents, each with their personalized templates and industry focus. Varying scenarios require varying forms of business writing. However, the innumerable documents can be distilled into to four main categories. Each category has its overall goal. Based on the objective, each of the many business documents falls within these four broad segments. 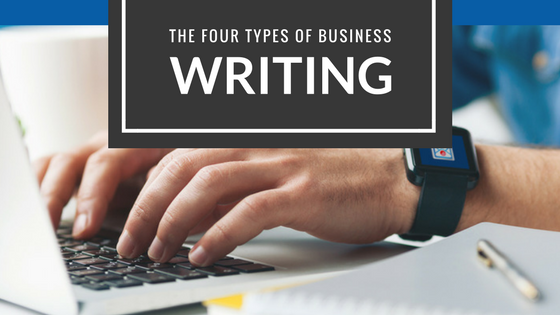 This article will break down the broad field of business writing into four categories. Understanding these conceptual divisions will help guide your decisions about your document choice and goal. While the document goal varies, the core of business writing does not. Effective professional writing is written with a clearly defined audience and purpose in mind. This is results-oriented writing. The text helps the reader do or know something. The writing style should be written to be concise, relevant, and understandable. Excessive wording, jargon, or extraneous information have no place in any type of business writing. Each element of the document supports the communication of the purpose to the reader. Of course, good writing is free of grammar and spelling errors and inaccurate information. Instructional business writing provides the reader with the information needed to complete a task. The task may need be accomplished immediately or it may be for future reference. This type of document must break down a process into steps that are understandable to the reader. The written record must account for reader’s knowledge of the area, the scope of the task while integrating variations or potential problems. User Manual: a guide focused on allowing the customer to use a product. Effective user manuals are crucial to a good user experience and a happy customer. User manuals are often considered part of technical writing, which is closely related to business writing. Specifications: a technical document which provides an outline of a product or process that allows it be constructed or reconstructed by an unfamiliar but knowledgeable user, enabling effective distribution. Memo: a short notification of new information shared within a large group in an organization. The memo may include a direct instruction or be a reference on how to complete future tasks. Not all business writing requires action. A large volume of writing is created for reference or record. This category can include some of the less glamorous but still essential documents. Recording business information accurately and consistently is important for marking progress, predicting future work, as well as complying with legal and contractual obligations. Report: perhaps the bulk of informational writing is report writing. Organizations rely on reports to act, to communicate business and technical information, to capture work completed, to record incidents, to finalize projects and recommendations, and to act as an archive. A well written report allows the reader to easily grasp the content and, if applicable, make informed decisions. Financials: documents that outline the financial state of a company. These statements provide a fiscal snapshot of a company over a defined period. Minutes: a summary of the proceedings of a meeting. A record of discussions, decisions, and assignments for attendees and others. When people think of business writing, they often think of the persuasive writing category. These documents are generally associated with sales. The persuasive writing may be direct, with focus on a specific item, or indirect, with focus on developing the client relationship. The goal is to two-fold: to convey information and to convince the reader that the presented information offers the best value. The text is written to impress the reader and sway their decision. Proposals: these documents outline an offer of a product or service to a specific potential client. The proposal generally presents project overview, benefits, timeline, costs, and competency. Sales Email: an email written to a large number of people to pitch a product or service. Everyday communication falls under transactional business writing. The majority of this writing is by email, but also includes official letters, forms, and invoices. An easy way to quickly improve your transactional business writing is to take an online course. These documents are used to progress general operations. They are also used to convey good and bad news, often associated with human resource processes. Emails: documents used to quickly communicate information between staff or clients in business activities. Read our guide on how to write a business email here. Dismissal notice: this letter provides the official context and procedural details associated with employment termination. Each business document falls into one of these four categories. By determining the category, you will better understand your document’s goal. This insight will improve your writing.